Current abnormal elevation of the diaphragm, either side, is disqualifying. The diaphragm separates the thoracic cavity, separating the the heart and lungs from the abdominal cavity and is responsible for respiration. ELEVATION of the diaphragm may be temporary or permanent as well as congenital or not. Though it may be painless, it is more often associated with symptoms such as pneumonia, hernia, lung abscess, liver abscess, and diabetes. Any nonspecific abnormal findings on radiological and other examination of body structure, such as lung field, or other thoracic or abdominal organ is disqualifying. Current abscess of the lung or mediastinum is disqualifying. Lung abscesses found by x-ray tests will be disqualifying until removed or healed. 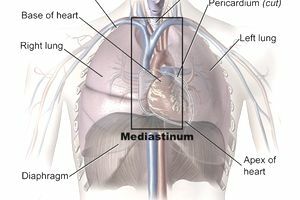 Most mediastinal abscesses are the results of secondary infection and can be caused by esophagus or trachea abrasions. Current or history of acute infectious processes of the lung, including but not limited to viral pneumonia, pneumococcal pneumonia, bacterial pneumonia, pneumonia other specified, pneumonia infectious disease classified elsewhere, bronchopneumonia organism unspecified, pneumonia organism unspecified, are disqualifying until cured. When the germs that cause pneumonia reach your lungs, the lungs' air sacs become inflamed with fluid. This causes the symptoms of pneumonia, such as a cough, fever, chills, and trouble breathing. When you have pneumonia, oxygen may have trouble reaching your blood. Long term damage can be done to the lung wall as well and will be reviewed by military doctors when evidence of previous pneumonia has occurred. Asthma, including reactive airway disease, exercise-induced bronchospasm or asthmatic bronchitis, reliably diagnosed and symptomatic after the 13th birthday, is disqualifying. Reliable diagnostic criteria may include any of the following elements: substantiated history of cough, wheeze, chest tightness, and/or dyspnea that persists or recurs over a prolonged period of time, generally more than 12 months. Current bronchitis, acute or chronic, symptoms over 3 months occurring at least twice a year, is disqualifying. Current or history of bronchiectasis is disqualifying. Current or history of bronchopleural fistula unless resolved with no sequelae is disqualifying. Current or history of bullous or generalized pulmonary emphysema is disqualifying. History of empyema is disqualifying. Current chest wall malformation, including, but not limited to pectus excavatum, or pectus carinatum, if these conditions interfere with vigorous physical exertion, is disqualifying. Current pulmonary fibrosis from any cause producing respiratory symptoms is disqualifying. Current foreign body in lung, trachea, or bronchus is disqualifying. History of lobectomy is disqualifying. A lobectomy is a surgery to remove one of the lobes of the lungs. The lungs have five sections called lobes. The right lung has 3 lobes. The left lung has 2 lobes. A lobectomy can be done when a problem is found in just part of a lung like an abscess, tumor, or severe damage due to smoking. Current or history of pleurisy with effusion within the previous 2 years is disqualifying. Pleurisy is a condition in which the membrane consisting of a layer of tissue that lines the inner side of the chest cavity and a layer of tissue that surrounds the lungs (the Pleura) becomes inflamed. Current or history of pneumothorax (also known as a collapsed lung but occurs when air leaks into the space between the chest wall and lungs), occurring during the year preceding examination, if due to trauma or surgery or occurring during the 3 years preceding examination from spontaneous origin, is disqualifying Recurrent spontaneous pneumothorax is disqualifying. History of open or laparoscopic thoracic or chest wall (including breasts) surgery during the preceding 6 months is disqualifying.